Use analogies to help turn your students into better problem-solvers! 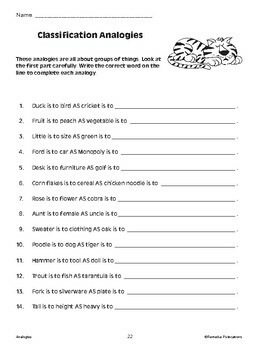 Showcasing a wide variety of analogy types, the worksheets in this set ask students to make the link between opposites in problems like Man is to woman AS king is to ______. and display an understanding of classifying objects in problems like Little is to size AS green is to ______. 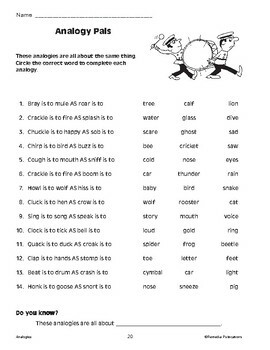 To solve the puzzles, students must make comparisons, analyze attributes, find associations, use visual/verbal discrimination, and form logical patterns. Answer key and performance objectives list included.